Saint Mercurius came from Cappadocia, and was the son of Gordian, a Scythian. A young man, and a soldier of high rank, he refused to offer sacrifice to the idols, and after torments was beheaded during the reign of Valerian (253-260). 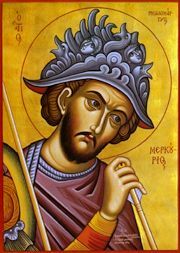 Share the feast of Mercurius the Great Martyr of Caesarea in Cappadocia with an icon greeting ecard.